I had a busy evening with S tonight, but when we came home, I decided it was time to tackle picking up stitches. I was a little nervous and picked up the stitches on the inside of the stocking instead of the outside. I decided it looked funny and started over. The second time around went perfectly. The pattern told me to pick up 9 stitches, but I think if I was to do it again, I would pick up 10 stitches. There are two tiny holes, one on each side of the stocking, but it looks fine. Now all I need to do is finish the foot and the toe and I am done! I don't need to graft the toe (I think that is the term) with the Christmas Stocking, but I think I have learned all the other necessary skills to make socks. 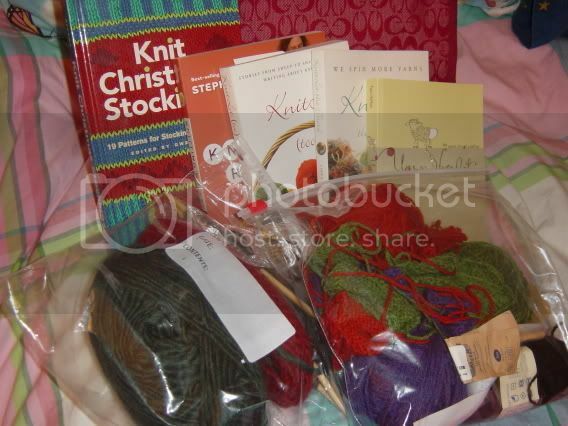 I am not even done with the Christmas Stocking and I am thinking about all the sock yarn I want to buy. I especially want to get some Opal tiger yarn. In fact, I might start on some house socks with my Cascade 220 that I bought a couple of weeks ago. I worked on the Christmas Stocking tonight. I turned the heel! I am so pumped, now I just need to pick up those stitches and then I am home free. Well, I am home free once I bind off, but that is just a detail! I hope. While knitting this stocking, memories of reading the American Doll books came rushing back. 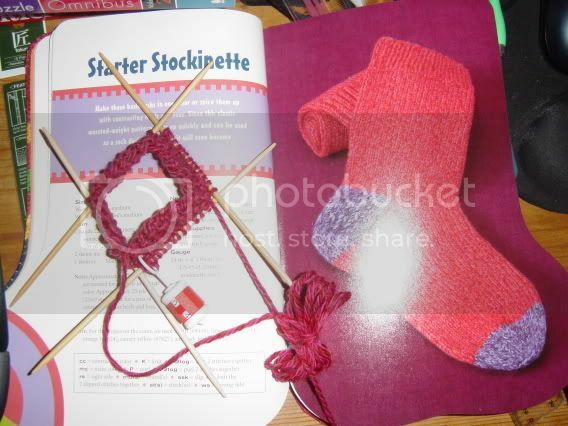 In one of Molly's books, the girls in her class decide to knit socks for the soldiers. Molly hates to knit socks, so she collects scrap metal instead. She tells her teacher that turning the heel is hard (such a lie, it is really easy). Once all the girls get to the heel part, they agree with Molly and turn their leggy socks into a blanket. I always bought this idea until now. How did they turn tubes into flat squares for a blanket? Were they knitting socks flat? Craziness. I also wanted to show you the turtle (aka Mysterious Present). 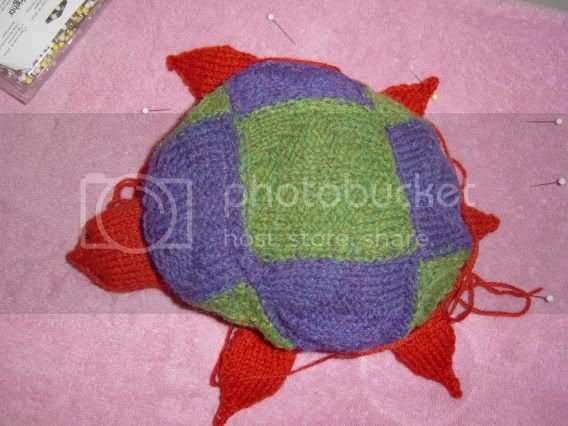 S loved it, but I told her I am knitting her something else with a better color scheme to complement the turtle. I just need to sew the legs, tail, and head to the body. It shouldn't take too long, but I am not sure how to attach them just yet. I will have to read up on various seams. OMG! I am on the Yarn Harlot blog! 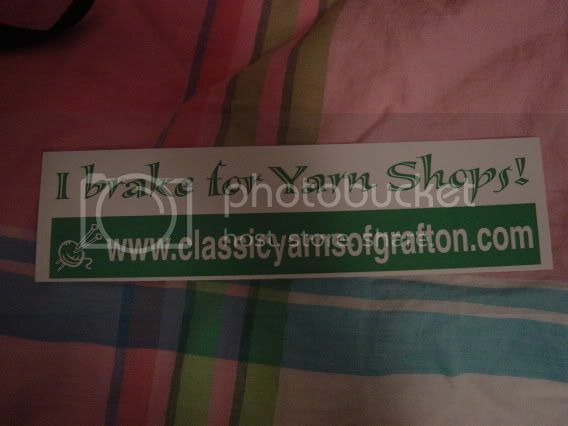 Okay, she didn't talk about me, but I am in two of the group shots at Grafton! Hey, this is my 15 minutes of fame, work with me here. If you are curious, I am the girl in the black jacket and green scarf. In regards to the mysterious present, I will post pictures later tonight or tomorrow. I decided to give my housemate a coupon for a knitted good, because the mysterious present is ugly as sin. Now, it is cute in an ugly as sin sort of way; it is ugly as sin in a hilarious way (I broke into tears of laughter after seeing all the pieces put together). Is it ugly in a way that I can still get away with giving it to the person I am sharing the last month of this house with? No, S deserves something that she can show other people without breaking out into laughter. I am sure that S would appreciate the gesture, but, yeah, a little frightening. I haven't gotten any farther with my Christmas Stocking. I haven't had to go to the clinic to recruit and I have been spending my evenings looking for apartments in Gainesville. ::sigh:: I thought the stress was over, but noooo, now I have to worry about moving. blah. I was listening to the Grey's Anatomy soundtrack today while cleaning the 12-month interview data. Yes, it is as mind numbing as it sounds. After all the interviews for a time period are double entered, I get a list of all the inconsistencies between the first and second enterer's data and figure out which answer is right by going through the hard copies of the interviews. The music is the only thing keeping me sane. Anyway, the song "Cosy in the Rocket" song (Grey's Anatomy's theme song) struck a cord with me. A line in the chorus is "Nobody knows where we might end up." 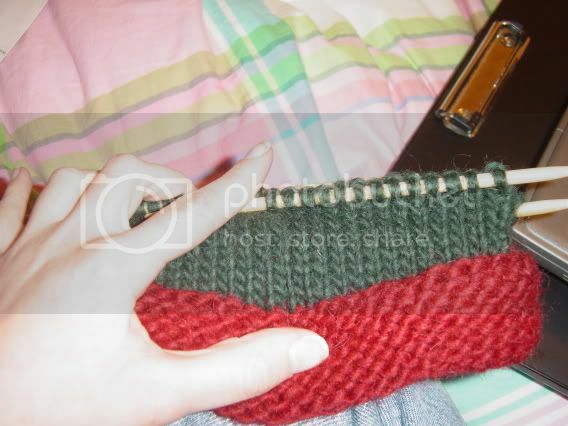 Now, I could use this line to analyze any and all parts of my life from my love life to my work life, but since this blog is about knitting, I will share my thoughts about this line and knitting. Last night, Theresa and I "commiserated" about moving to warm weather locales. Theresa did point out all the great shells and tanks we can knit in cotton blends and cotton yarn and I kept pointing out that it will be cool in the evenings in both Southern California and North Florida. I cannot believe I have found an amazing way for me to express my creativity and I am stepping away from the much desired cold weather and need for knitted wooly goods to be in Florida. This time next year, I could have been in Binghamton, NY and only a couple of hours away from Rhinebeck, but I chose Florida instead. As a knitter, I wouldn't have guessed that I would have chosen the warm locale. I am sure though that I will continue to knit and I will find ways to continue my love of all things wool while dealing with the warm weather. We might not know were we might end up, but that doesn't mean that the destination won't be right for us. PS I know people are waiting to see the mysterious present in its final form. I am not sure if it will find its final form. You know how you can be in denial for a real long time? I think it might be time to realize that the color scheme wasn't as faboo as I thought it was. Now that I have caught up on sleep and am ready for sleep depriving myself for yet another week (hey, I need my Conan monologue...maybe I should invest in TiVo), I am a bit more prepared to post. Before I let go of the amazing Yarn Harlot book signing experience, I have to share one last special moment. When Stephanie was signing my book, I told her I was making a Christmas Stocking as my first attempt at socks, so I wouldn't have to worry about gauge or fit. I could just worry about learning sock knitting techniques. After I said this, Stephanie looked at me with a flair of conspiracy twinkling in her eyes and said: "Plus you don't have to worry about Second Sock Syndrome!" I smiled and nodding my head vigorously. ::sigh:: We shared a moment! 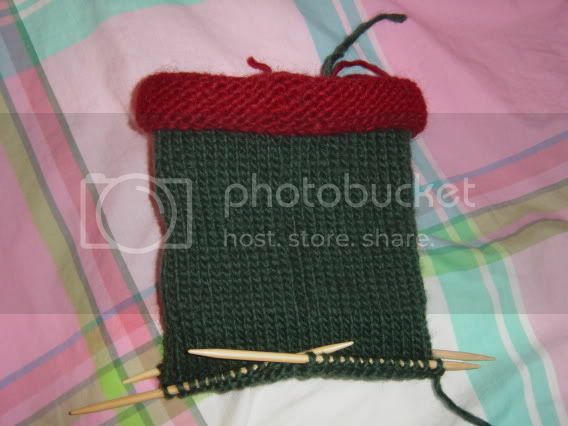 After making the decision to block, I put away the present and started working on my Christmas Stocking. Theresa and I got together to knit and watch Grey's Anatomy. We had fun catching up, knitting, and drinking tea. I finished the leg just as a "new episode" of Grey's Anatomy ended. ***Rant***Why are you having a montage episode??? If I wanted to know what was happening I would read recaps online or try to figure it out on my own. ***Rant*** Oh well, I guess you are not allowed to have good company, knitting, and a new episode of Grey's Anatomy. I have my post about the Yarn Harlot written up, but I am having trouble posting the very necessary pictures. Just know that it was a great experience and I will have all the details tomorrow. In less than two hours, I am going to see the YARN HARLOT! My throat has been scratchy for the past couple of days, so I have been downing cough suppresants in the hope that I won't lose my voice. I have things that I need to tell the Yarn Harlot. 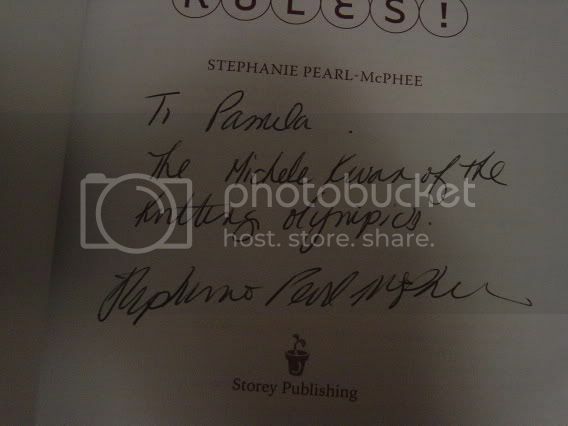 I need to tell her about my attempt to be in the Knitting Olympics and how just like Michelle Kwan, I had to drop out. Stupid broken wrist. E and I are leaving at 4:30 to go to Grafton and I am terrified that we are going to be late, that we aren't going to be able to find a parking spot, that we are not going to be able to see her. I cannot believe that I am having mini panic attacks about this. I wasn't like this about graduate school interviews, and those interviews were strongly linked to my future career plan. Go figure. I will have pics and stories to tell later tonight/tomorrow late morning (after Kim Possible, Darcy's Wild Life, and Endurance). I have been bitten by the sweater bug. By taking the plunge and making my first "sock," I am now in the state of mind to take on new and different sorts of projects. 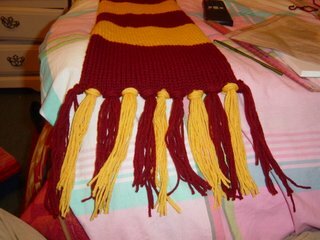 I am going to be more than a scarf and hat knitter! Not that I mind or dislike just making scarves and hats, but I think I am ready to try something new. I used to read patterns for socks and sweaters and be scared, but now I have a lot more confidence about my knitting ability. Just like Kim Possible, I can do anything! Now, about the sweater. 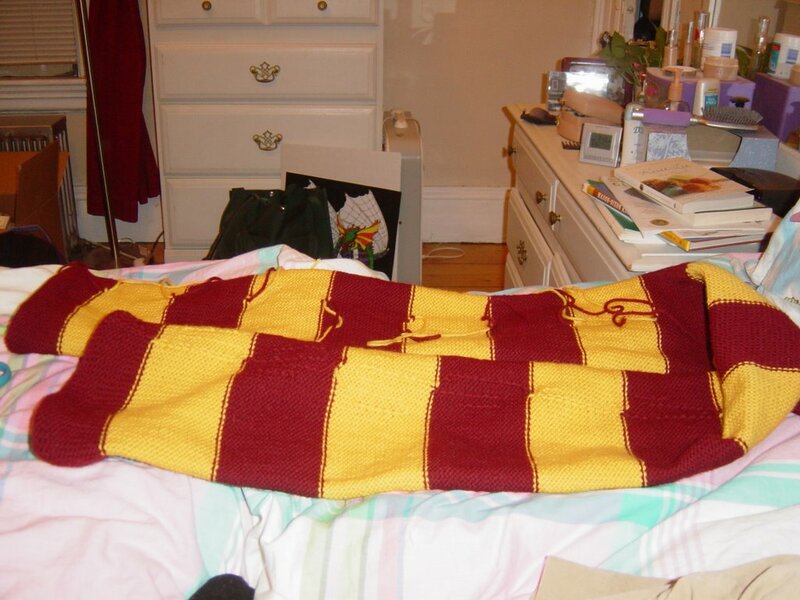 To be honest, when I decided that I want to make a sweater in the near future, I didn't just want to make any sweater, I wanted to make a Weasley or Gryffindor sweater. I have started looking at patterns, but I haven't found one that clicks just yet. I am trying to navigate the fine line between making a Weasley/Hogwarts-esque sweater and a classic sweater. For example, I am all about making a tweed raglan sweater, but I don't want to have a snitch on the front of it. I also don't just want to knit a tweed raglan sweater. 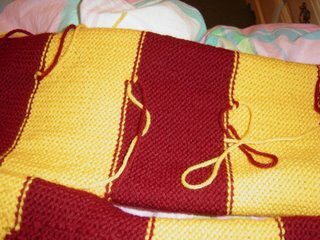 The Gryffindor scarf worked out well, because the gold and burgundy stripe pattern will always remain classic, but it still has that Gryffindor flare. Now if I can just find that in a sweater. I feel I should be completely honest about the sweater. I am also pumped about an excuse to get Ann Budd's The Knitter's Handy Book of Sweater Patterns and Maggie Righetti's Sweater Design in Plain English. 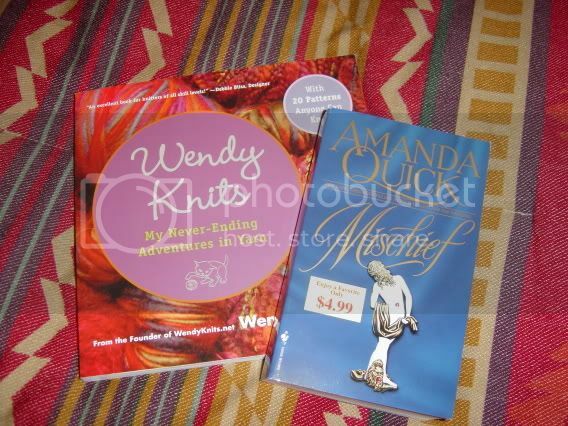 I already have a couple of books that talk about knitting sweaters, but any good researcher should have all the information in front of her before she starts, right? 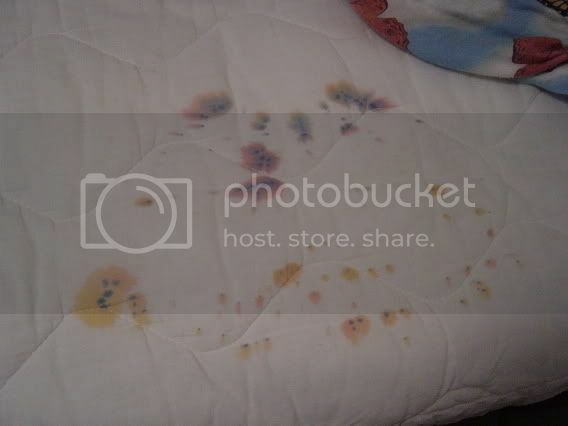 Today I found a completely amazing blog. The LA Fire Department has started their very own blog. How cool is that? I looked to see if Providence has one, but I couldn't find one. RI is supposed to become the first wireless state, but we can't have a city or state-wide blog? I didn't realize how much I wanted one until I saw LAFD's blog. I neeeed it, I waaaaant it. 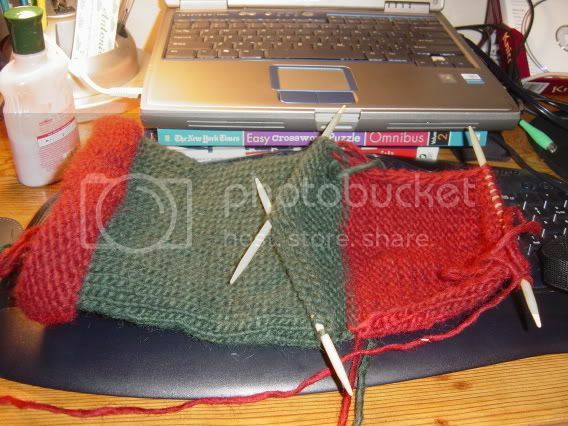 Okay, I am going to work on some of my knitting projects. Pictures will follow. I am going to go do things, because just like the Dunkin' Donuts commercials says: "Doing things is what I like to do!" Tonight was not the most productive evening I have ever had. I got a bit done on my Christmas Stocking, or as I like to think of it My First Sock! 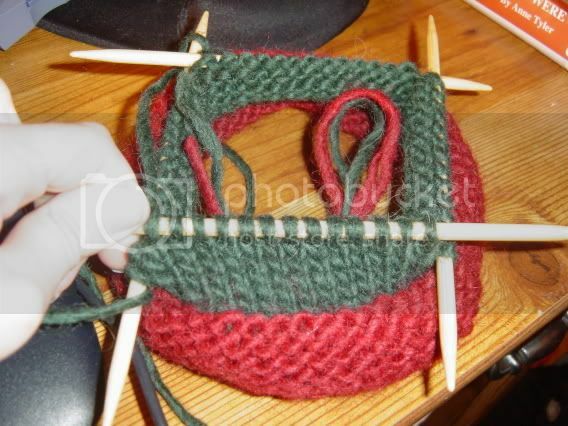 It is uncomfortable for me to knit in the round with double-pointed needles. 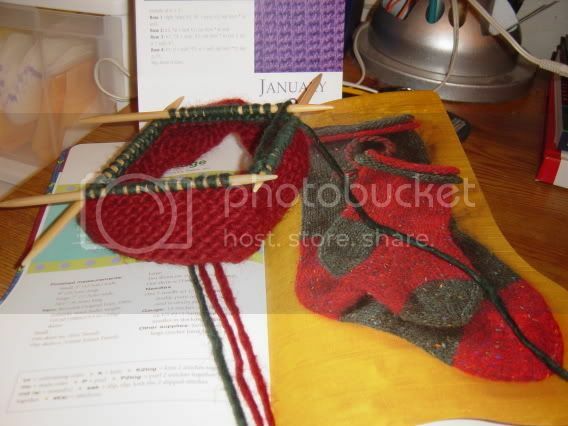 I have already decided though that I am going to make a sock (or stocking) using double-pointed needles, two circular needles, and one circular needle. I want to give each one the benefit of the doubt before deciding on one technique. I feel it will be useful in the long run, so I can convert any sock pattern from one knitting in the round technique to another. 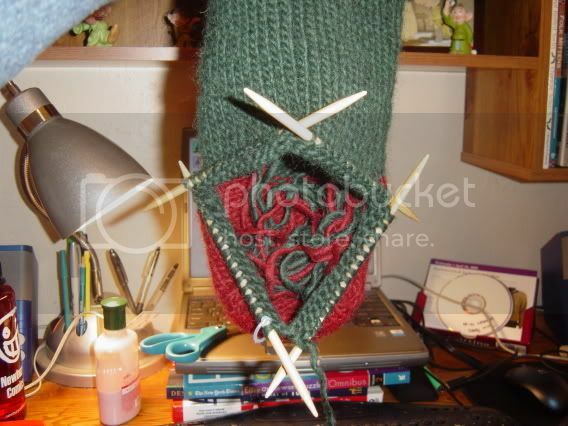 So far, I must say, double-pointed needles are not winning the race to my heart. I spent a good chunk of time at the clinic today waiting for people to DNKA (did not keep appointment), because waiting for people to show up is just setting the bar too high. One of the nurses told me again that she wanted me to make her something and then said that she would pay for it. Now I don't want to be a knitting snob, but when she says this, it isn't inspiring me to knit for her. I just smile when she says this, and she usually finds a new topic before I open my mouth anyhow. Oh! 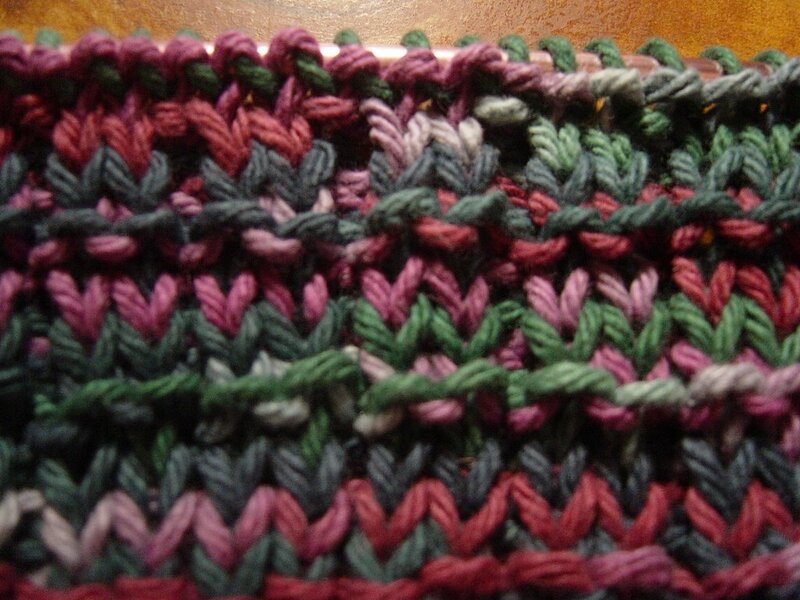 after working the Whelk pattern dish cloth today, I have decided that it isn't as ugly as before. The colors are starting to swirl a bit more and is slightly more friendly looking. I will not buy this particular color again, but this will still be a decent dish cloth. It will do its job in dignity. Do you see that?! That my friend, that is a Christmas stocking. Yes, it isn't a sock, but I don't want to worry about Second Sock Syndrome just yet. 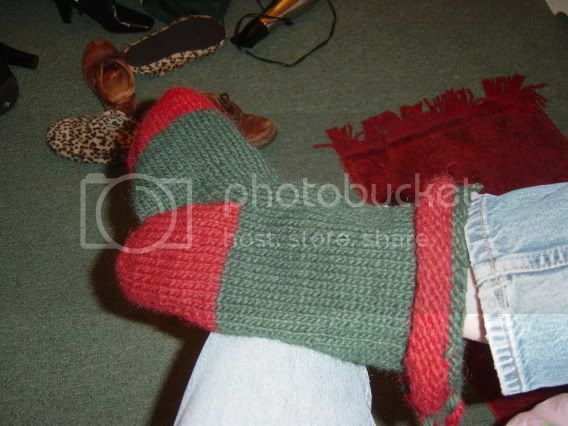 Ever since I broke my wrist, I have been scared to try knitting socks. I had lost all my confidence in my knitting ability. I started thinking that maybe I was only meant to make hats and scarves. Maybe breaking my wrist was a sign that I was never to knit a pair of socks. Tonight, however, I regained my confidence. It might have been due to the fact that I didn't want to work on my Whelk Pattern Dish Cloth, but no matter! I regained my confidence! I am having a minor ladder problem on two of the corners, but it isn't that noticeable, so I am just going to keep going. To be honest, I am partly afraid that if I frog it, I am going to go back to dish cloths or, heaven forbid, the mysterious present that needs to be done in the relatively near future. I am tired of it hanging over my head like a vulture waiting for me to give up. Don't I think of lovely metaphors late at night? In happier news, I am going to see the Yarn Harlot THIS FRIDAY!!! I am so excited. Maybe I will be on her blog! I could die a happy knitter if that were so. 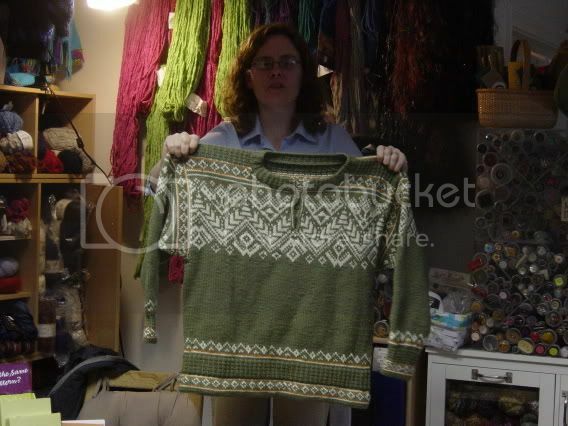 ::sigh:: I totally need to get over this knitter crush. I can't honestly say I am a monogamous knitter crusher. 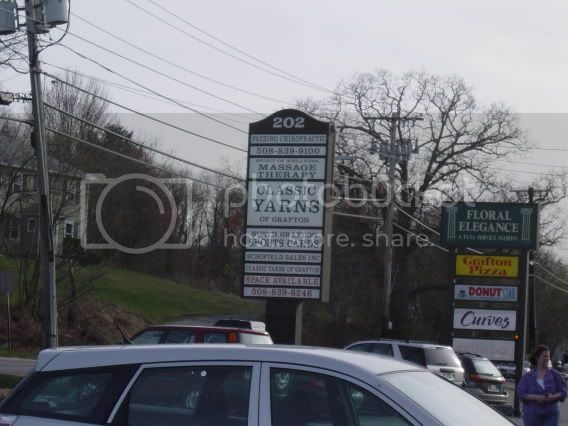 If Wendy (of Wendy Knits) or Ann and Kay (of Mason-Dixon Knitting) came to the nearby area I would be freaking out just as much. This is healthy, right? It has got to be better than doing drugs. PS I am now part of the Knitting Bloggers webring! For all of you surfing the webring and came here, welcome! I hope everyone had a lovely day whether they are of the Easter celebratory persuasion or not. My brother R and I went to my housemate's family's house for Easter dinner. I was never a big Easter person and the last couple of Easters I spent at college, since we didn't get the holiday; however spending time with family (even though it wasn't my own, except for R) was quite nice. It was great going on an Easter egg hunt and comparing loot with others. 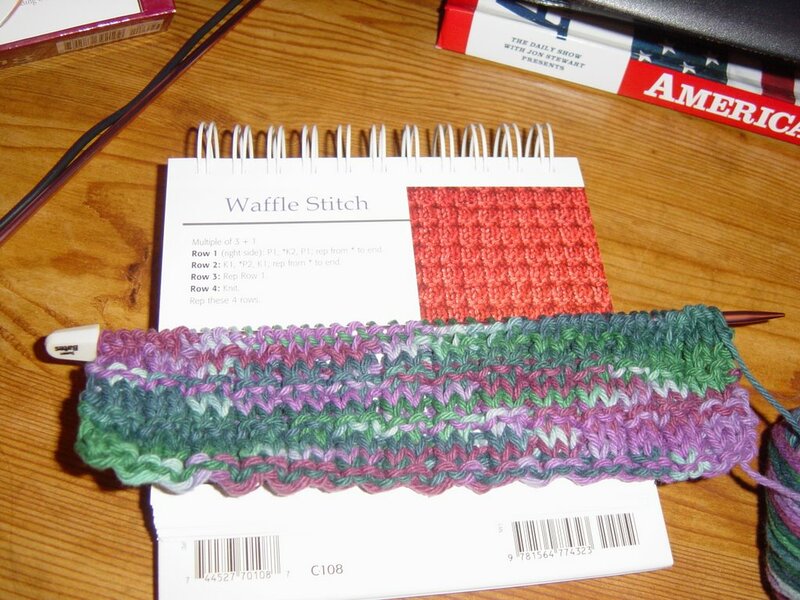 As promised, here is the finished Waffle Stitch Dish Cloth. The colors did pool, but in a nice zig zag sort of way. To be honest, I wasn't too psyched about the pattern, but now that I cast off, it is starting to grow on me. 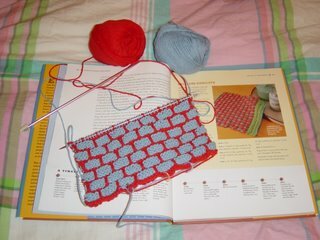 Of course, this could be because I am not happy with the Whelk Pattern Dish Cloth I started this weekend. The pattern doesn't look like it does in the 365 Stitch Pattern Calendar. 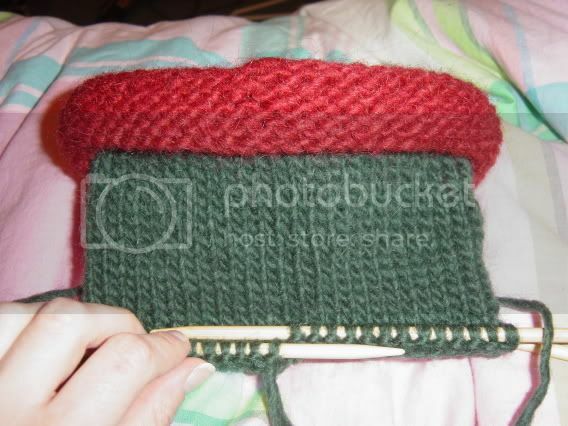 I am doing the pattern properly, but the yarn I am using just isn't making it so far. 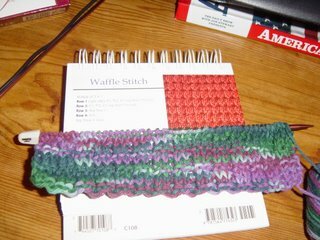 I am going to keep going, because I am hoping that the coloring will do a nice zig zag like the other dish cloth did and suddenly make it pretty. You can't see the whole thing in this picture, but you see what I mean? This is the front and the color pattern is just one big mess. I will work on it tomorrow and then make my decision. BTW, I saw "Thank You for Smoking" this weekend and it is amazing! Go see it. It is funny and clever until the end. Last night my brother flew in from PA to visit me for Easter. We spent today going to Boston for some big city fun! We spent most of the day at the New England Aquarium, later we saw Deep Sea 3-D, and finally popped over to Windsor Button to stroke the yarn. 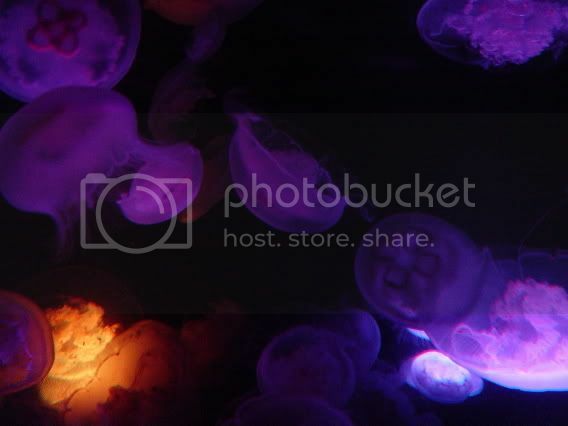 Aren't the jellyfish beautiful? They are so delicate yet (some of them) are quite dangerous. While walking through the jellyfish exhibit, though, I noticed that there was very little information about the creatures near their tanks. 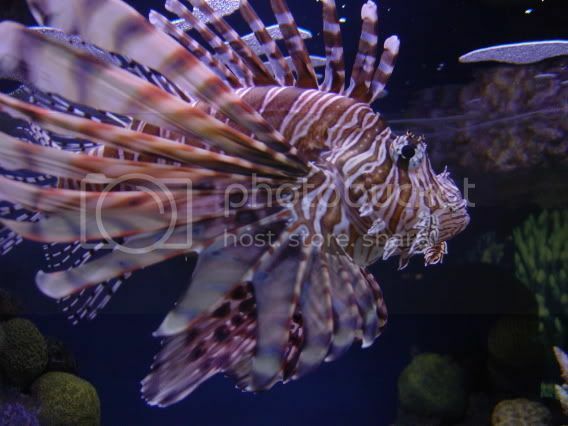 In fact, throughout the aquarium you were lucky to find out more than the creatures scientific names and common names. I guess people are not inclined to read the information, so museums and aquariums don't post as many educational materials as before. If academic institutions are expecting people to be just looking for a quick cultural fix though, they could at least let visitors associate the exhibits with other popular culture paraphernalia. For example, in the jellyfish exhibit, the aquarium could have pointed out which species was the one that Dory and Marlin encountered in Finding Nemo. I would have been interested to know. I have to give major props to my brother. He didn't bolt when I took some pictures of dish cloth at the aquarium. Dishy really liked the fish. 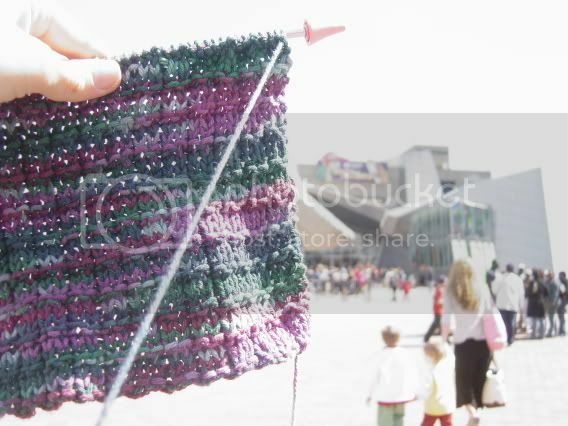 This was my first time photographing my knitting in a public place and it was great! Now, I am going to have to bring a small project on all my outings. I don't like getting my picture taken since I am not photogenic. I am not being modest here; it is a fact. Now, though, my knitting can take my place in vacation pictures. Oh, you want to know about Windsor Button? I got three balls of Lion Brand Kool Wool in a burgundy color (it was on sale), Chibi tapestry needles (I have the Chibi jumbo needles and looooove them), and a row counter for circular needles. It was a pretty quick trip, since R was pacing back and forth the whole ten minutes we were there. They had Mission Falls and Cherry Hill Farm (I think that is the name of it) and I am kicking myself that I didn't pick some up. Oh well, maybe on another weekend. In regards to the dish cloths, I finished the one in the above picture and am working on another one. I will post pictures later. Today, I had a lot of time to think about knitting (yes another slow day at the office, don't let anyone every let you think clinical research is always action packed), and I thought I would share two musing I had. The first one was something that had been rolling around in my head for a while, but Brenda Dayne's latest podcast on Cast On really brought it to light. Brenda talked about memories and knitting and how the objects we make retain a part of the life we were leading when we knit them. 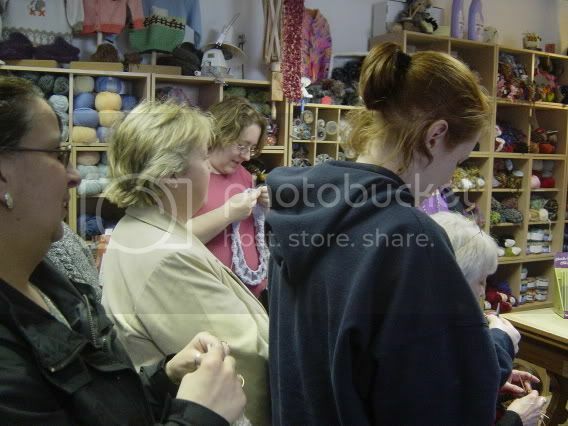 In some ways I had to agree with her, if I pick up any of my scarves and hats, I can remember vividly where I bought the yarn, where I was sitting when I was knitting the object, and how I felt about the object when I was making it. 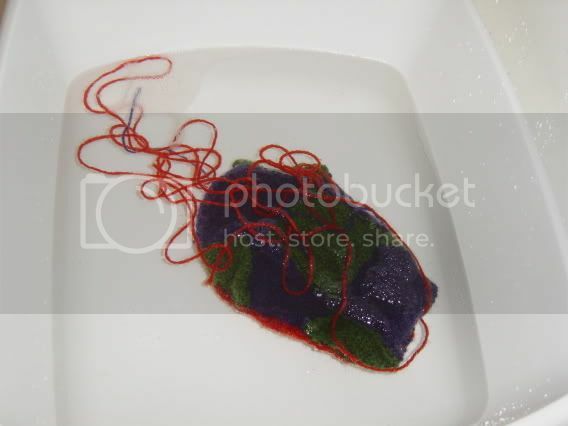 At the same time though, I do not remember any other memories when I look at my knitted things. I don't see my hats and think of GRE stress or see my scarves and think about all the self-doubt I had about myself when I applied to graduate school. To be honest though, I am glad that I look at my scarves and hats and only remember knitting them and nothing else. This leads me to my second musing: When is a knitter ready and willing to give knitted objects away and knit objects for the express purpose of giving them away? Let me address the issue that I just mentioned in the last paragraph. I really like to knit. I associate knitting with being happy and relaxing. I have been knitting for a little over a year now I am somewhat timid of knitting something and knowing that I am going to give it away, or even worse, that the relationship with the person will change while I am knitting the object and I will will always have a reminder of the person or of an event (for example, knitting a shawl for a friend's wedding that doesn't end up taking place). Also, who really deserves a homemade object? While knitting at the medical clinic and waiting for potential participants to come to their doctors' appointments (people! please come to you appointments! ), some of the nurses started telling me that they want me to make them scarves. I really like these women. They are nice and treat me well; however, the more they push for knitted goods, the more disinclined I am to make them something. I keep wondering if they will appreciate the object. Will they look at it and see the time and energy spent on each stitch?There are people who I could knit something for and would appreciate the handmade aspect of it, because they themselves are craft people and understand the effort involved in making an object, but there is still the question will you be happy that you sent your object to a far away place? So after thinking about all of this, I keep asking myself, am I ready to start knitting for others? Am I willing to associate the knitting objects with potentially negative memories? Am I ready to give my knitted objects' homes that won't necessarily appreciate them even when I screen the recipients as much as possible? Wow, that seemed like a downer. Here is a picture of the dish cloth, I finished yesterday. I am almost done with the second one, so I will post that one tomorrow. Speaking of tomorrow, my brother is coming to visit me! Well, actually, he has Easter break and he got kicked out of the dorm, BUT he is coming to see ME and not my parents! Yea! Hopefully, I can convince him that we need to go to Boston, so I can take pictures of my knitting with the penguins at the New England Aquarium. I finished my first dish cloth this evening. I say first, because I am hooked on dish cloths now! They knit up so quick, I can get tons of Sugar & Cream and Peaches & Cream for mere pennies, and I can try out all different sorts of stitch patterns! 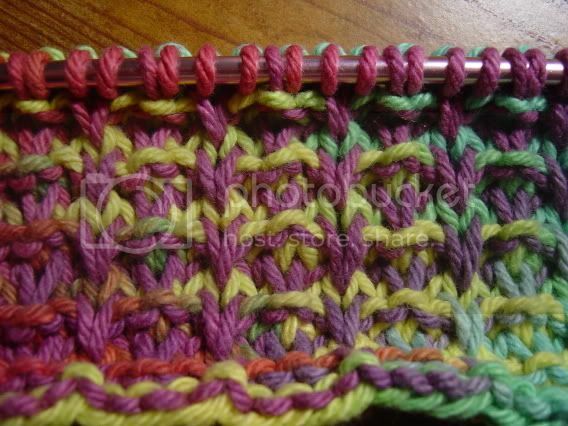 After I finished the drop stitch pattern dish cloth, I started on another one which will be about the same size. This way, if I want to give them away as a gift, I can give away several and they will all look about the same size and have that store bought look while still rocking the wickedly cool homemade feeling. For this second one, I pulled out my 365 stitch calendar and picked out the waffle stitch pattern. Why did I pick this one? It wasn't too lacey (not good for something that is supposed to soak up water), it is somewhat bumpy (for that scrubbing action), and I thought it was pretty. Of course, I didn't pay too much attention to the actual pattern (I did look for patterns with no increasing and decreasing for some unknown reason), so I was "surprised" when I discovered that the pattern is ribbing that is broken up by a row of knit stitch every four rows. 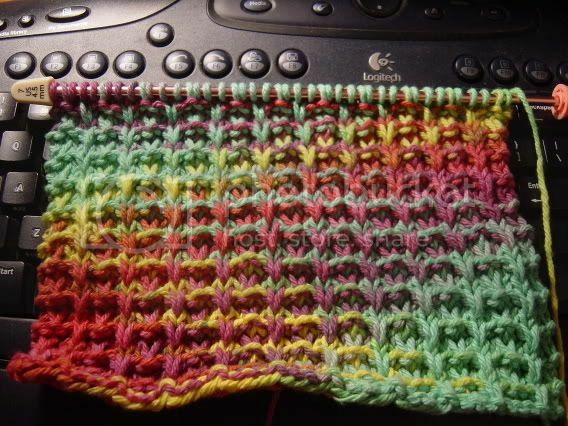 It is probably not the best pattern for a dish cloth since it will expand with the water, but I must say that it looks pretty cute. 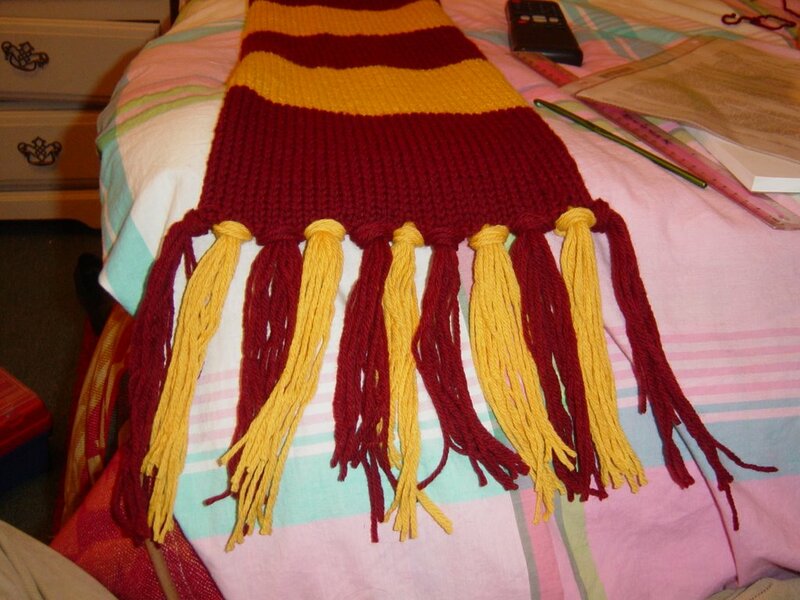 So I finished half of the SCID scarf (again), and I have to tell you that I think I am going to rip it out (again). This is the thing, I keep thinking that I remember the pattern I used for the pink fun fur scarf, but I don't remember it. I don't look up the pattern, I just keep frogging it over and over again. 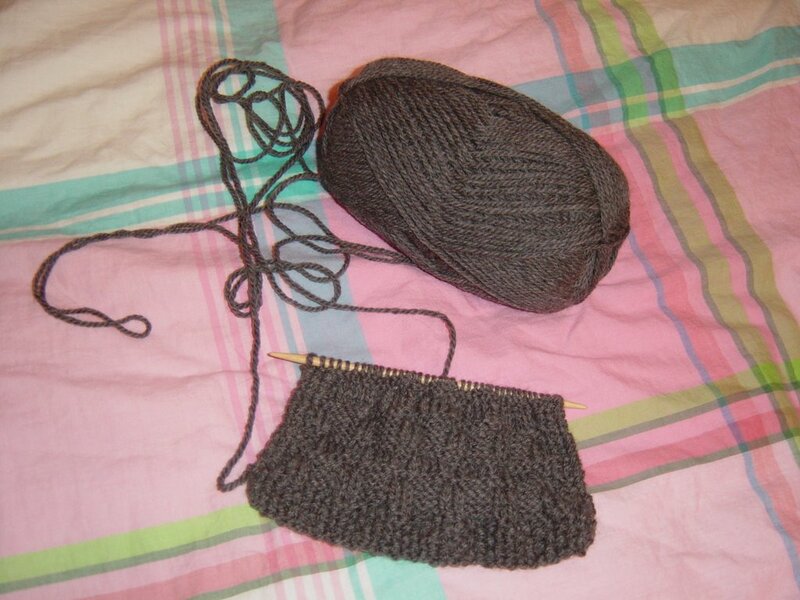 I have decided that the size 17 needles are right, but the 17 stitch rows are just too long. In fact, it is incredibly long. I think I should just be casting on 7 stitches, but at this point I don't have the heart to do it. I work on this scarf while sitting at a medical clinic and I think that the nurses must think that I am incredibly slow, since I have been working on the same cookie monster blue fun fur scarf for about a month now. I know I should just bring another project if I feel so self-conscious, but I feel compelled to work on it there. I think it is because I don't need a pattern (ha ha) for a garter stitch scarf and the rows are short enough that I can always finish the one I am working on before I have to screen someone for the marijuana study. Ugh, okay, okay, goal for tonight: look up pink fun fur scarf and figure out the number of stitches to cast on. This has been quite a productive weekend! On Saturday I made my car official. I got my car inspected and it is supposedly nice and safe until April 2008. Of course I am going to have to get in reinspected in August when I move to Florida. ::Sigh:: While waiting FOUR HOURS to get my car inspected, I hung out at the Seven Star Bakery reading Knit Lit the Third and working on my textured scarf. Even though it was insane amount of time to wait for a little inspection, it was really nice to sit and read and knit. I seem to be rushing from one place to another or multi-tasking at least five different things, so it was a wonderful experience to just concentrate on one task at a time. After I got my inspection sticker, I went to my friend E's house and wound some yarn. Isn't it pretty? You can't really tell from the picture, but there is a central red wine color with flecks of other reds and pinks interspersed. It is the Cascade Quatro that I got on sale last week. I am not sure what I am going to do with it just yet, so I am going to let it stew a bit in the stash. Hmmm, maybe a pair of mittens or a pair of house socks? After reading Mason-Dixon Knitting, I started jonesin' for some Peaches & Cream yarn. (Do people actually "jones" for things anymore? I work with substance abusers and I have never heard them use the term.) 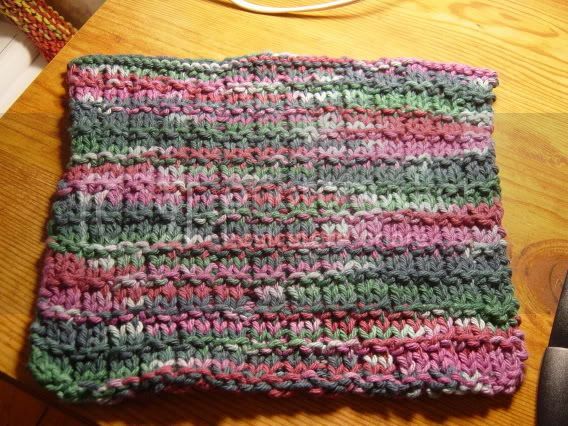 I bought some cotton yarn to work on a dish cloth. Yes, a dish cloth. I don't even use dish cloths, but I needed to make some. 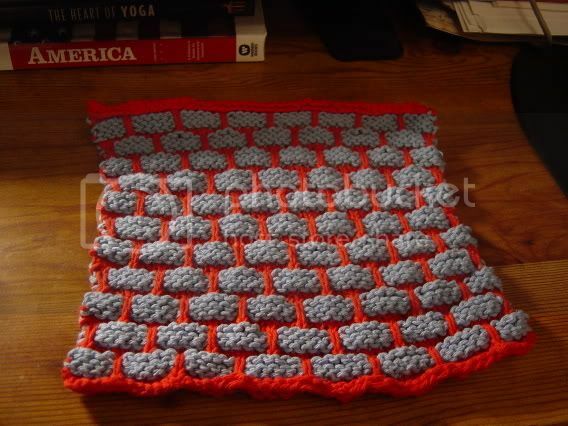 In fact, I feel the need to make multiple dish cloths. Dish cloths in multiple colors and in different stitch patterns. Since I don't use dish cloths, I am going to have to find people to give them to. You better watch out if your birthday is coming up, because they might be coming your way! ;) You have to admit, though, they are pretty cute. Here is my first one. By the way, the best part about this project is that I had to kick the textured scarf off these needles to make the dish cloth (that is why the scarf is pictured on a double-pointed needle and is all scrounched up). I am on a roll! I just finished my Cable and Rib Cap. I was almost done last night, but I messed up on a stitch and I couldn't seem to figure out what I did. I had three stitches attached to one another instead of one. I gave up at 1AM and today, my co-worker E fixed it in ten seconds. It was amazing. I did the last ten rounds when I came home tonight. The weather is really crummy here in Providence, so I keep working on wool hats and scarves. I don't think the weather is going to break. In fact, as soon as the cap left my needles, I started back up on the textured scarf. 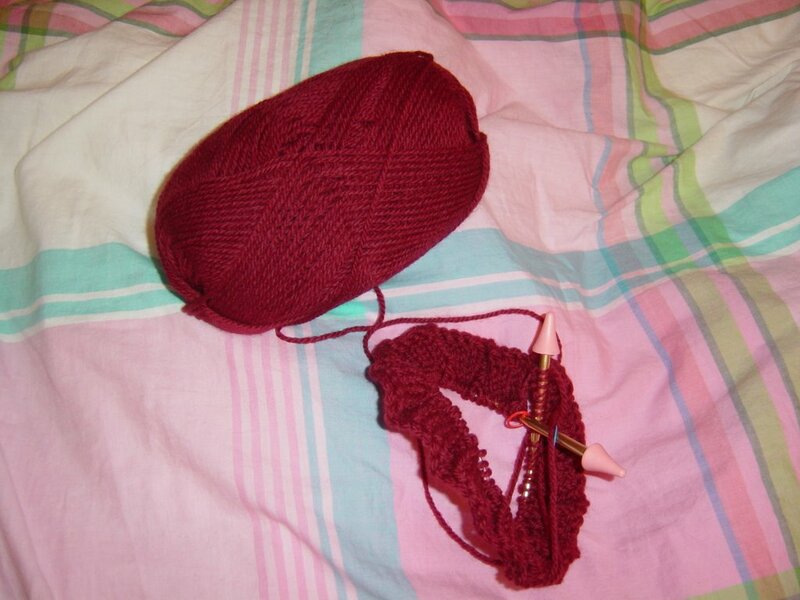 I like working on it since I use straight needles and they are easier for me to hold than the circular needles. I really like making hats and other tubular objects, but those tiny needles really hurt my hands after knitting for a while. I think this is one of the reasons that I am not jumping on the sock bandwagon. I guess it is more fun fur scarves for me! Oh! 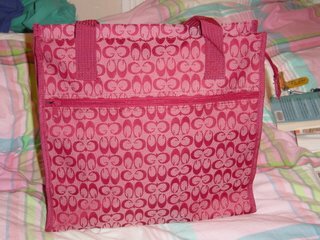 I forgot to mention that I got a fabulous knitting bag on Wednesday. The bag is the perfect size for two small projects or one medium sized project. 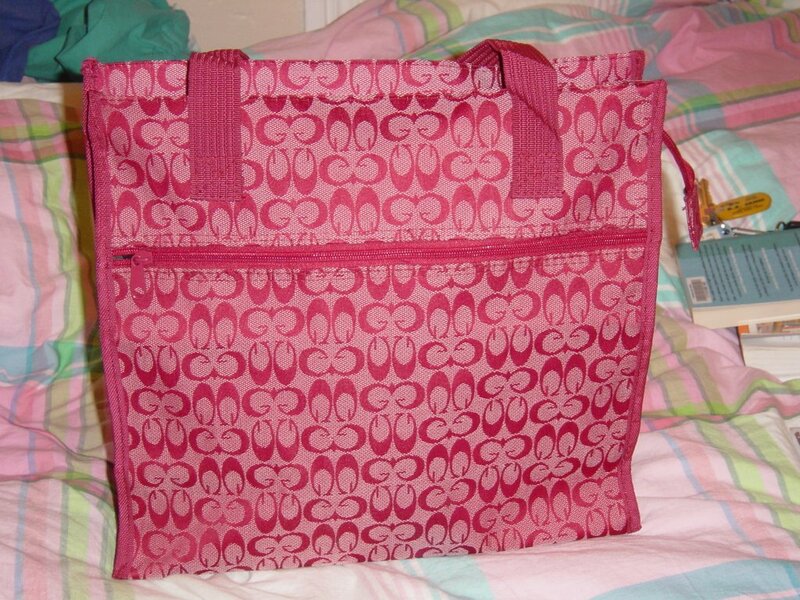 It is a Coach knockoff. How can you tell it is a fake? If you take on peak inside, the lining is horrific and there is a "Made in China" tag in it. Also, there aren't C's on the outside of the bad but G's instead. I talked with my parents about my moving to Florida in the end of July/beginning of August. The current plan is that my entire family (mom, dad, and brother) are going to drive my little Honda Civic to Florida. We are going to get a little trailer and and attach a hitch to my car. Now, I am a little nervous about the four of us being squished into my car with all of my stuff (and my family's suitcases), but there is valuable knitting time to be had! The previous plan involved me driving and as much as I do like to drive my car, I wasn't really looking forward to driving on the George Washington bridge. Now my dad is going to drive and I am going to be knitting all the way down! 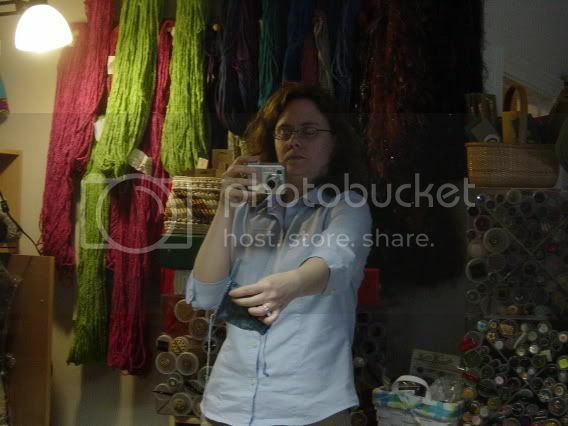 I am just trying to find a way to convince my parents that all of our rest stops should be near yarn stores. This seems doable, right? 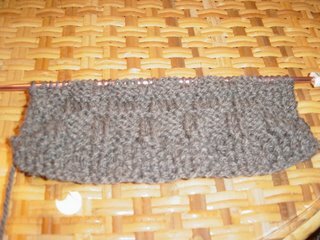 In other news, I learned how to do a cable cast-on and started the Cable and Rib Cap from the Knitting: Pattern-a-Day 2006 calendar. It is going well, but I am nervous that I am knitting too loose. 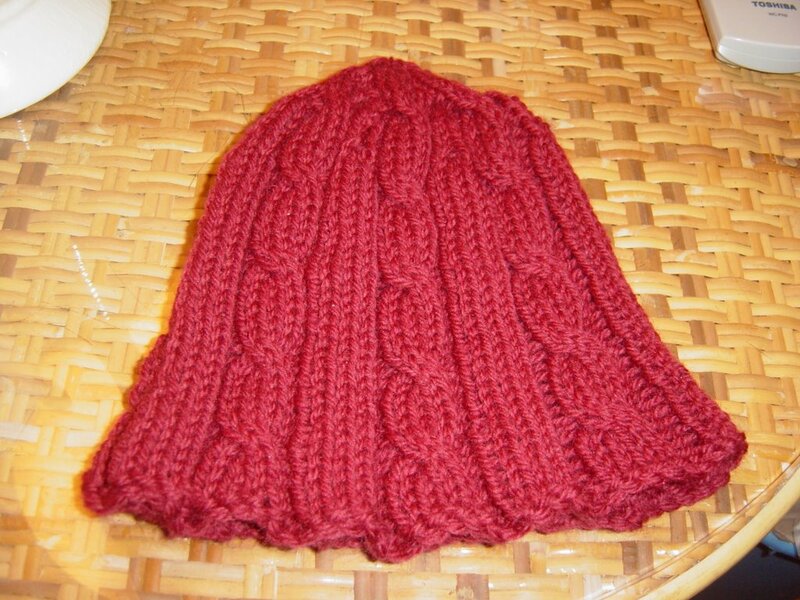 I know that EZ really pushed knitting loosely over knitting tightly, but I don't want a hat that falls off my head. 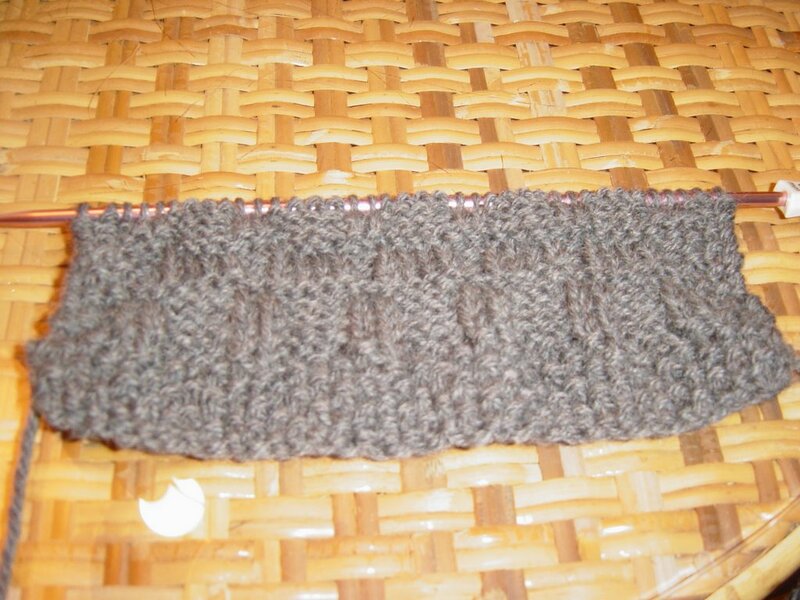 Maybe I should have knit a swatch first. Yeah, that might have been a good idea, but from my eyeballing of what I have so far, it looks okay. We shall just have to see what happens. 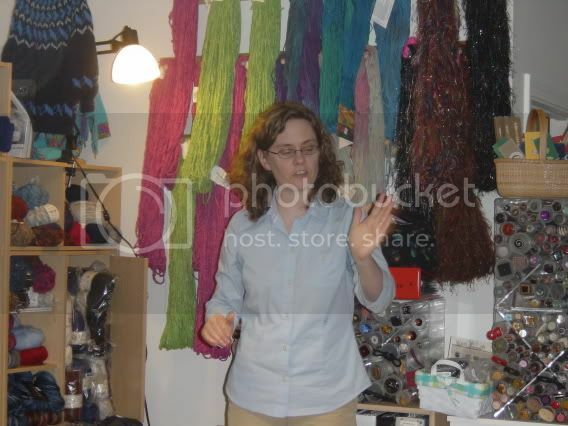 My co-worker E called the yarn store in Grafton, MA for the Yarn Harlot book signing and we might not be able to go! We are currently on the waiting list. The owner isn't sure if she wants just a book signing or a sit down thing. I should note that the sit down thing can only accommodate 20 people! Keep your fingers crossed for us, because if we can't go, we might drive to Northampton, MA to see her. If you (yes you) ever write a book, come to Providence, RI. We are a happy state. Actually, now that I think about it, come to Gainesville, FL too, so I can take advantage of the book signing as well. Since I took an hour-long nap this evening (yes, this evening not this afternoon), I am not tired at all and decided to give you guys a real post as opposed to the random shout outs of before. The day wasn't all disappointments though, my co-worker E is going to let me wind the Cascade 220 I bought at Fabric Place at her house. I am hoping that this project will prevent me from going out and buying my own swift and winder. I KNOW I shouldn't buy them. I keep chanting "I can't fit a winder and swift in my car" over and over again, hoping against hope that I listen to myself. Maybe I will get them for my birthday. Wait a minute! 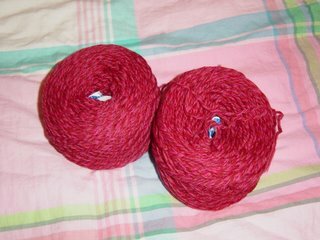 I could also get myself YARN to go with the swift and winder and since it would be for my birthday, I could go all out. Well, as all out as one can go on a graduate student's budget. Thank goodness for cheap yarn online. 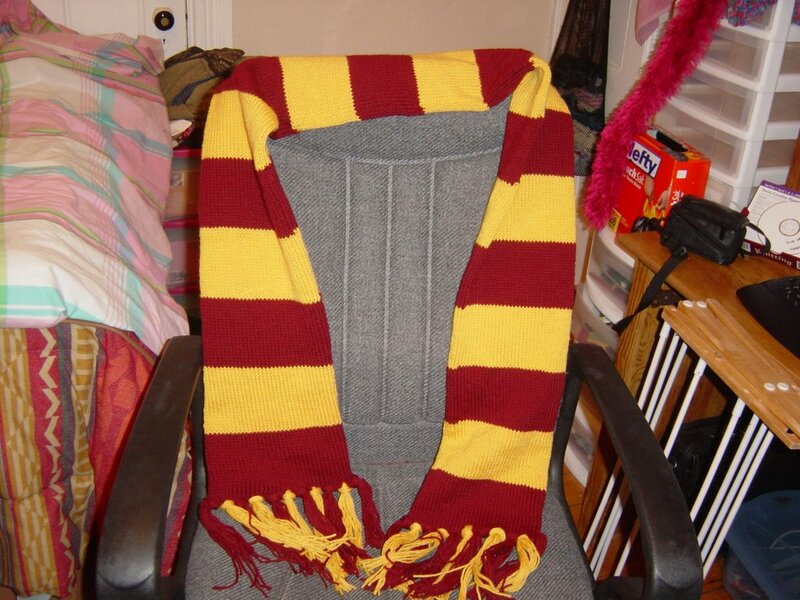 I didn't work on the Harry Potter scarf tonight. There, I said it. I feel better now. I did work on my blog a bit and tried to make it prettier. Isn't that just as good? Only time will tell. After I post this, I will even have some buttons my blog. I am not sure how to simply get pics on my blog without first posting, so just ignore the buttons at the bottom of this post. Tomorrow I promise to have a more interesting post!